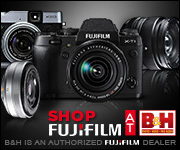 The Fujifilm X-T1 (Graphite) edition offers some new features that will also be available to original X-T1 owners via a firmware update in December 2014. 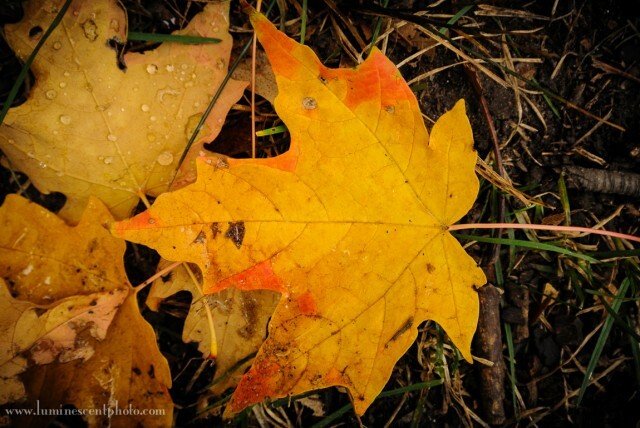 Image courtesy of Fujifilm. Electronic shutter option for fast primes: You will be able to shoot at a shutter speed of up to 1/32,000s with the electronic shutter. That’s perfect for using a fast prime in bright light without having to stop down. The downside is that this feature will only work with the 23 f/1.4, 25 f/1.4 and 56 f/1.2 Fuji prime lenses (I’m scratching my head on that one). Natural Live View Mode: Because the X-T1 uses an electronic viewfinder (EVF), the viewfinder displays the scene with in-camera settings applied, like monochrome or “Velvia” mode. What that means is that sometimes the viewfinder image is too contrasty or saturated due to the chosen film emulation mode. Natural mode will display a normal image in the viewfinder, while the captured images will have the film emulation settings applied to them. Linking the focus area to the metering area in spot metering mode: This is something my Nikon’s do, and it’s a feature I find quite useful. Currently, the spot meter uses the center of the frame, meaning you can’t just choose a metering area with the focus points without recomposing the shot. Sadly, the one feature I really want, ± 2EV bracketing, wasn’t on the list. I hope Fuji reconsiders and adds this feature… it would make HDR capture so much easier! The X-T1 (Graphite Silver) is available for pre-order from site sponsor B&H photo for $1499 (body only). You can also pick up the original X-T1 (black) in a new bundle with the 18-135mm zoom lens (highly recommended) for $1899. I had a chance to sit down with Tony Sweet for this episode of The Sensor Plane podcast. Tony and I discuss the recent advances in mirrorless camera systems; he’s started using the Fujifilm X Pro-1 and he recently took it on a photo workshop he led in Havana, Cuba. 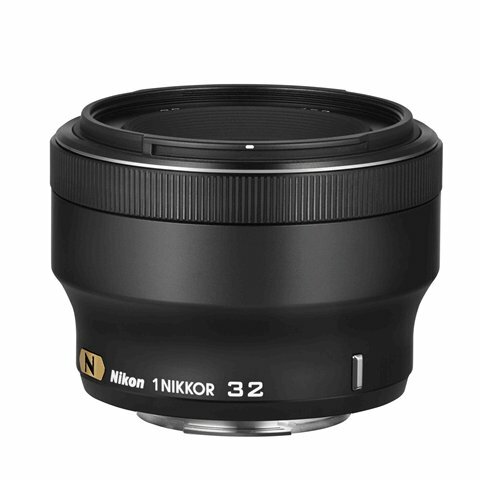 The newest addition to the Nikon 1 system is a very fast portrait lens. 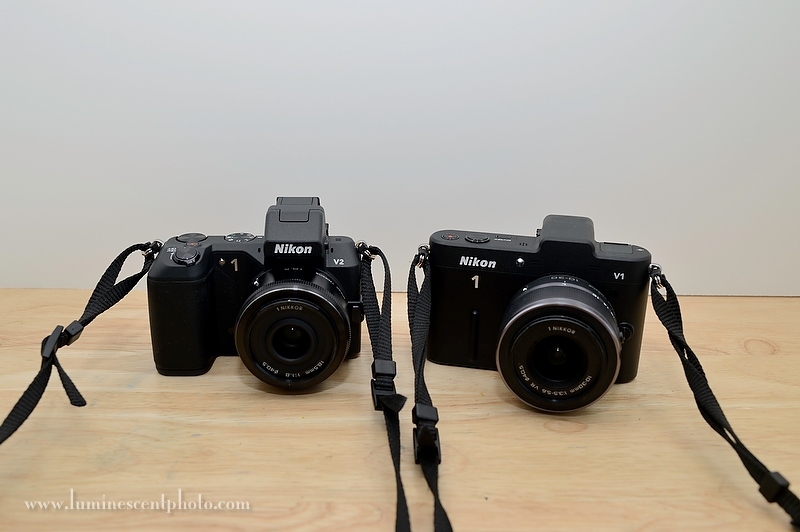 Nikon 1 V2 (left) compared to the Nikon 1 V1. Other than the larger viewfinder, the V2 is actually smaller and lighter than the V1. For the last year, I’ve used the Nikon 1 V1 as my primary travel/family camera. In general, I found it to be a good camera with some ergonomic quirks. In late October, Nikon announced the V1’s successor, the Nikon 1 V2. I took delivery of my V2 a few days ago and while I haven’t done complete testing, I thought I’d offer up some of my first impressions, especially with respect to what I thought the shortcomings of the V1 were back in February. The Nikon 1 V2 offers a 14 megapixel CX-format sensor. The camera’s base ISO is 160, and is expandable to ISO 6400. The body design and control layout is totally new and more in line with Nikon’s DSLRs. The Nikon 1 V2 can shoot at 15 fps without any metering or focus limitations (as far as I can tell). The V2 sports a small built-in flash unit.